We all fall in life but it never means its the end. Sometimes its the beginning of exercising one’s potential to do great things in life and who knows you could shock the world after not to mention inspire others to rise up. Hope unveils more for fallen boxer that once again had to be picked up. Conjestina Achieng has spoken of a plan to start a foundation that will help in training young girls. “It’s my dream to ensure that I have a foundation that will see girls fight and help them to stay fit,” she said. A clip of an improving Conjestina was shared today after a visit by Nairobi county sports management board led by former MCA Hashim Kamau. Hashim said they will let her use the City Stadium gym for the time being. “We are happy with the progress she has made so far and we are hoping to support her more,” Hashim said further promising to equip her training centre. The team says Conjestina also asked to be discharged so that she can go back to working out at the gym. They said that they are waiting for the doctor’s report on her discharge before they arrange for her accommodation. Conjestina, in the clip from the hospital, says she was thankful to the governor for catering for her bills and taking care of her. 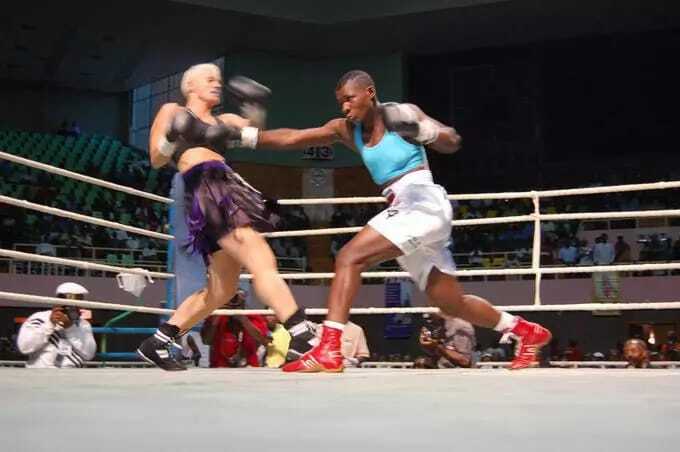 Veteran boxer Conjestina Achieng’ is having a time of her life at the Nairobi West Hospital where she is undergoing treatment. She was airlifted to Nairobi after someone anonymously shared a video of her plight at their rural home in Gem, Siaya county. “Conjestina had requested for pizza and a jacket. She also requested for tracksuits and Sonko branded t-shirts,” a member of the sports board said. She was seen enjoying a pizza that the sports management board delivered to her at the hospital. Do you believe Conjestina will fulfill her big dream?